Looking down Hiland Valley near the start of the trail in mid September. 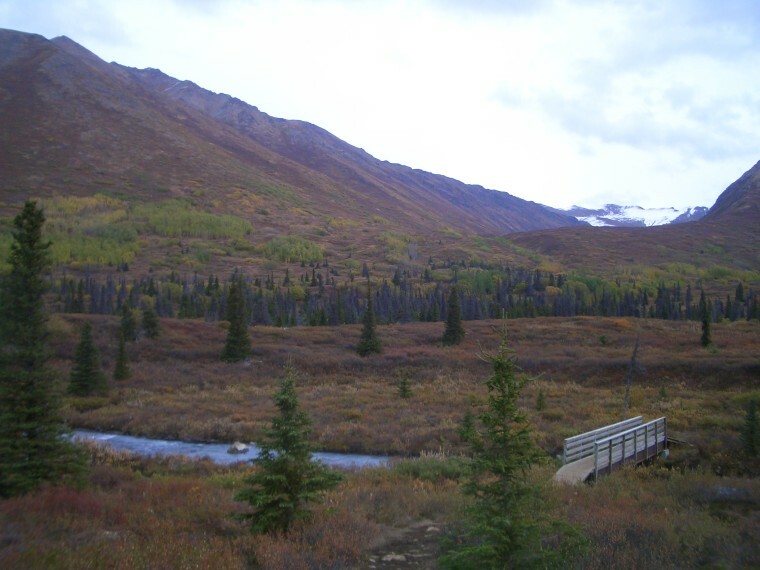 A bridge crosses the south fork of Eagle River early in the trail. Eagle Lake, with Eagle Peak is in the background (middle-left). This interesting hexagonal hut is located between the 2 lakes. It can be used in emergencies for weather protection. Symphony Lake is the smaller lake, and has a different clear-blue quality. Behind Eagle Lake are some facinating places. Waterfalls appear a ways back; even further are Flute Glacier and Eagle Peak. 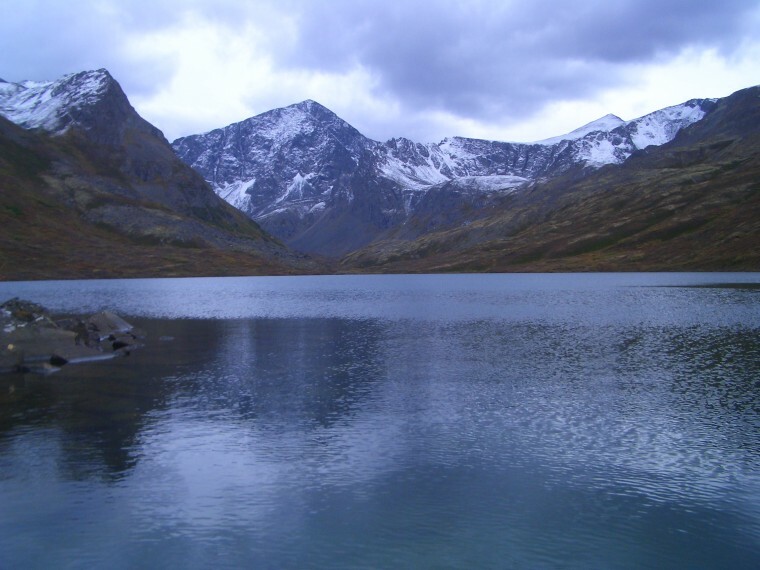 The South Fork Trail leads to Eagle and Symphony lakes, two strikingly different lakes nestled close to one another at the back of a large valley. The path starts from a short wooden walkway, then proceeds through an inititally hilly section. Just over a mile from the trailhead, a bridge is in place which crosses the south fork of Eagle River (hence the trail's name). Just beyond this point the trail will split; take the path on the right, towards the back of the larger valley (or if desired, take the alternative route to Hanging Valley). From here on the trail maintains a mostly gentle course towards the lakes. After crossing a tiny bridge, it makes it's way to a rocky section of boulders, where one can proceed up to the lookout point between Eagle and Symphony lakes. 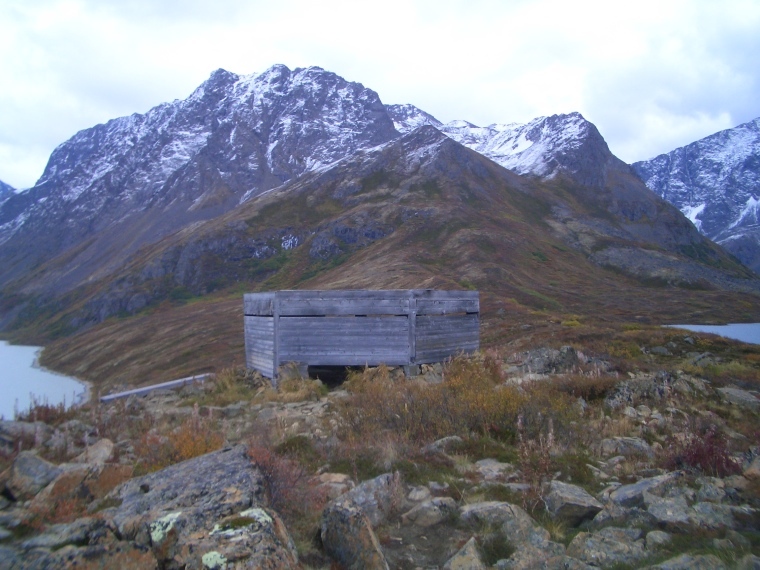 There is a small hexagonal cabin-frame structure here, which can be used for weather protection on an overnight trip. 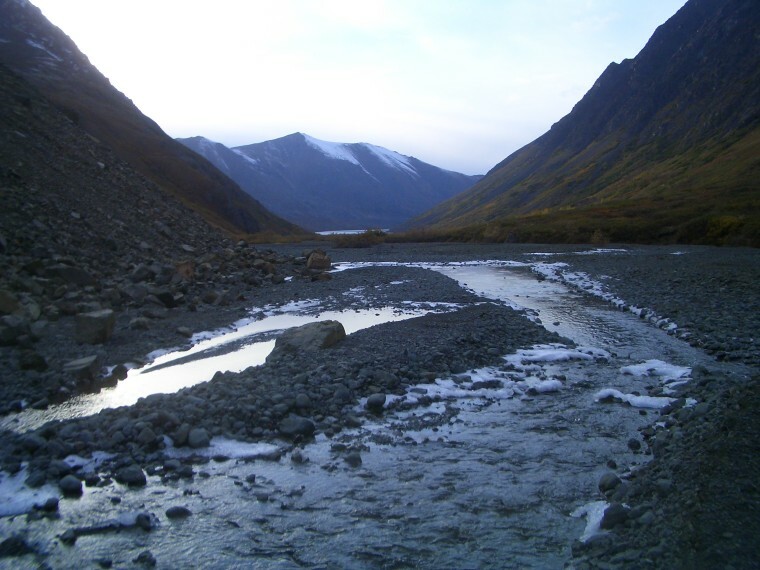 You can also proceed further behind Eagle Lake and head towards Flute Glacier and some interesting waterfalls. Fairly easy for the most part. Most of the trail is relatively level. The slight up and downs at the begining, as well as the last section which entails some bolder hopping, does bump the difficulty up - but not by much. 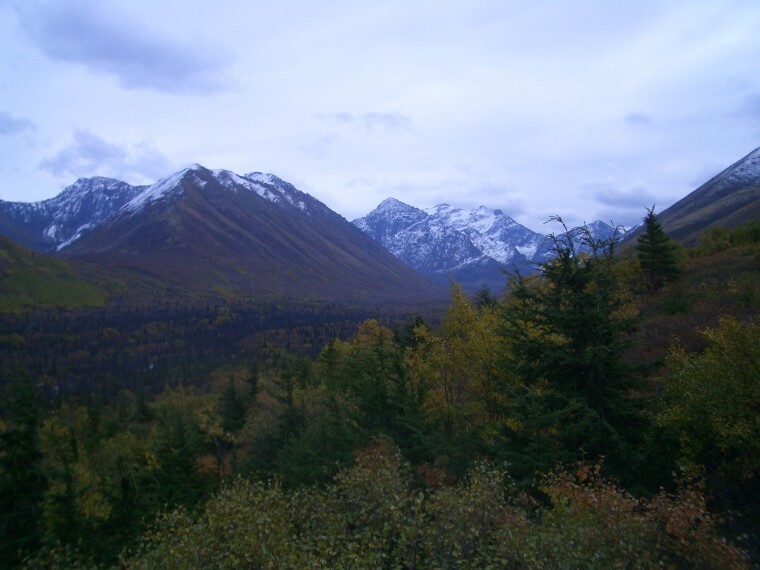 From Anchorage, head northbound on the Glen Highway for roughly 8 miles. Take the Eagle River Loop exit, head right, then take a right at the intersection, onto Hiland Road. Follow this road for several miles until it winds it's way into Hiland Valley. After passing through a steep gourge, look for South Creek road on your right. Turn, then turn right again onto West Creek Drive shortly afterwards; the parking area where the trail begins will be on the left. Eagle Lake is a teal color, while Symphony Lake is a clearer aqua blue. 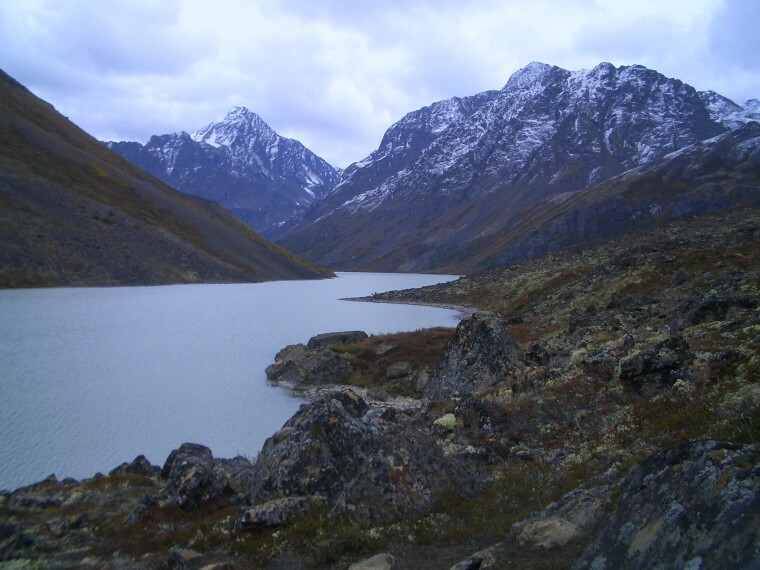 This difference in color is due to each lake's water source, Eagle's being a glacier (which brings silt) and Symphony's merely being runoff from snow and precipitation.